Autumn is nature’s gift for aligning with the energies of contemplation, for even as the season’s are indeed cyclical and therefore without a true beginning or end, they also exhibit undeniable patterns uniquely their own, and some of these patterns are of termination. Autumn leaves blaze forth in glorious reds, oranges, golds, and yellows, but then they fall. We often prefer to focus on the colorful display without acknowledging that its stunning imagery results from the dissipation of green chlorophyll, which signals that the life cycle of the leaf is coming to an end. This aspect, too, is part of nature, and an autumn gathering invites us to reflect on what this means for the Earth and indeed for ourselves. For us the late autumn celebration is a formal affair. We dress up, and decorate in fancy measure as we consider the natural aspects of death both actually and metaphorically. 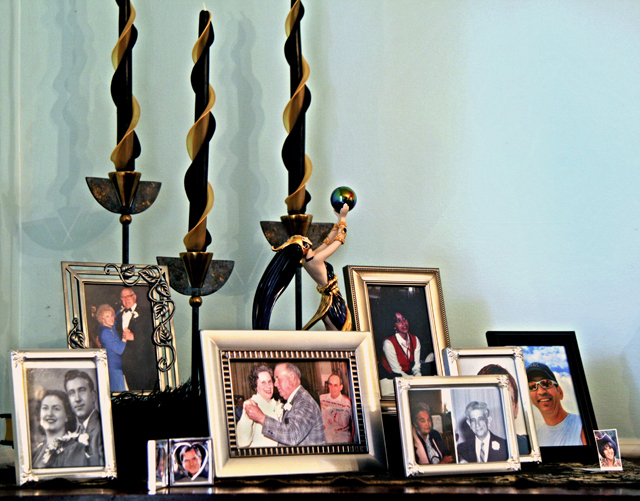 In a very concrete sense, we create a “table of remembrance” with pictures of those who have died who have had an impact on our lives, and we invite our guests to contribute to it as well. Metaphorically, we also examine “death”. What aspects of our lives are not working for us anymore that we would like to lovingly release, like the falling leaves, so that as the cycles of our own lives renew themselves, we can start afresh? 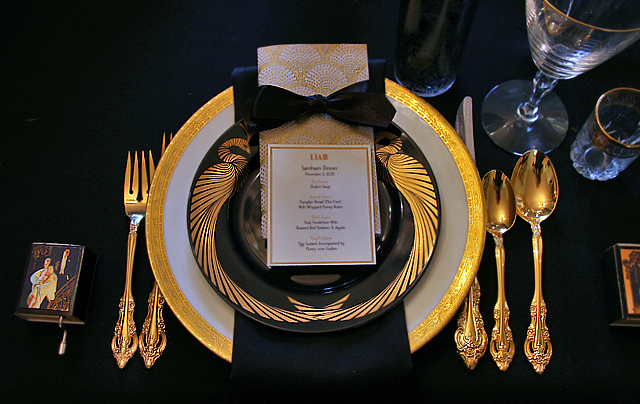 When preparing a table design for a celebration such as this, black is the color that comes to my mind because it represents the unknown, the abyss, and invites us to examine the largely unexamined, to peer in deeper and find the love beneath the fear. I also frequently choose to integrate jewel-toned colors in keeping with the natural autumnal palette. This year, I chose gold and black. I enjoy selecting vintage styles as they are reminders of times gone by, providing yet another context, in this case a social one, in which to examine natural cycles. Though any style could have worked, I think it is important to choose that which personally offers inspiration. 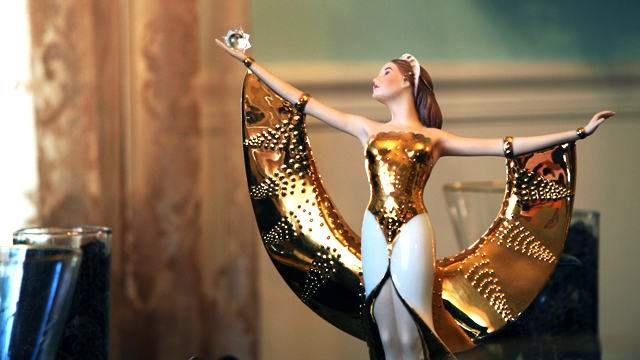 This year, perhaps as a nod to my most admired author, F. Scott Fitzgerald, I decided to go with art deco. I approached the centerpiece by crafting my concept and then seeking out artistic pieces as messengers. 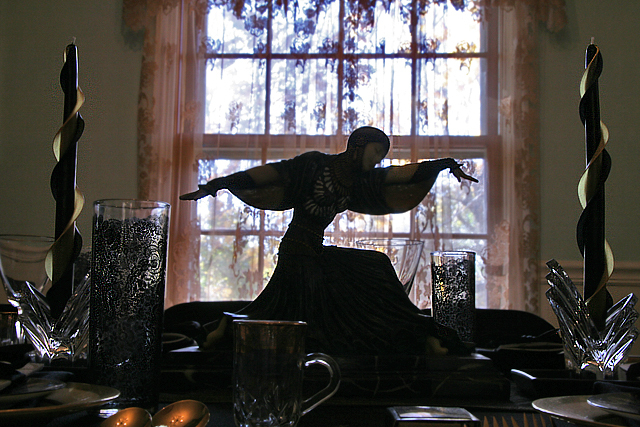 I decided to utilize sunrise and evening as metaphors for birth and death, a central figure to represent the “dance” of life between these two archetypes, ravens to symbolize the messengers between the known and the unknown, and candles to counterbalance the darkness of the table and serve as reminders of the duality of existence. I acquired many vintage items to further the authentic reflection. Specifics are listed below. Enjoy! 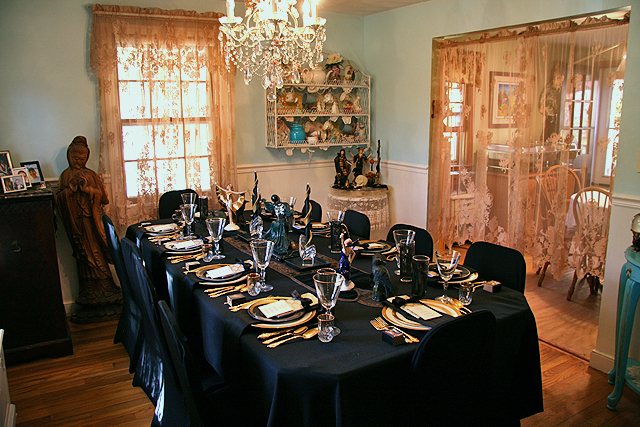 Chair Covers: black spandex, available at: eFavorMart.com. 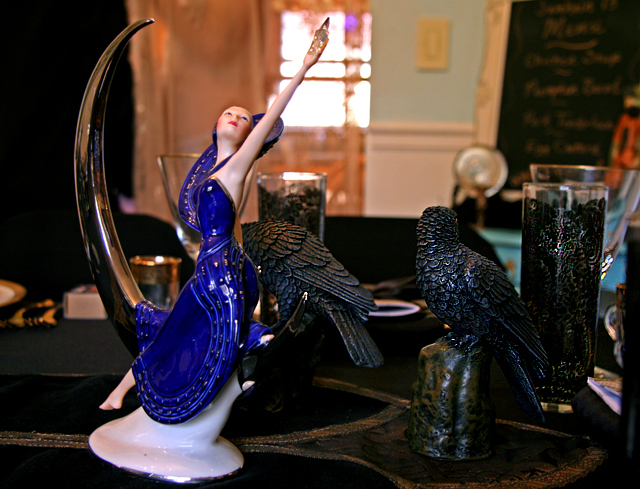 Raven Statues: available in three styles (all three used on table) from Gaelsong. Hurdy Gurdies: from Victorian Trading Co. (Halloween-themed) – personalized with Leyendecker images printed onto photo paper and affixed to the fronts. Menus: printed onto ivory card stock using MS Word, separated by course. Because they are personalized, these also serve as minimalist place cards. Calendars: 2 Year Pocket Calendars – Blank Covers, purchased on Amazon, covered with art deco print art paper using spray adhesive and then embellished with black ribbon. … And may your late autumn reflections lead you to increased confidence, warmth, peace, & clarity.